Hello and welcome once again! They were also accompanied Father Chinh Nguyen of St. Ambrose Parish in Dorchester where there is a vibrant Vietnamese community. 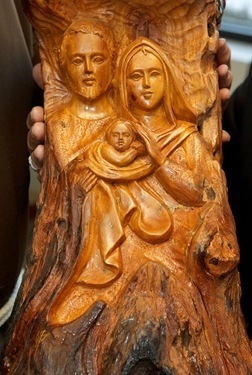 The bishop brought me the gift of this wooden carving of the Holy Family. 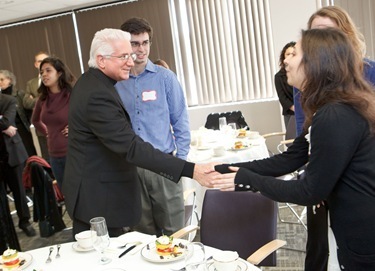 Last Thursday, I attended a gathering of the Parents Alliance for Catholic Education, known as PACE, which engages in advocacy and public policy work on behalf of Catholic school students throughout the state. They work for social justice and school choice, as well as assist our Catholic schools in securing available state resources. 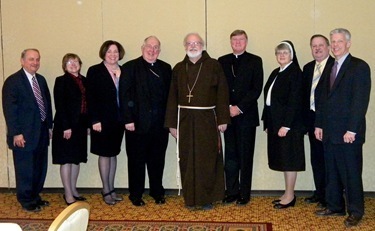 They have been very instrumental in accessing many different funds and services for our Catholic schools. If you are the parent of a Catholic school student, I encourage you to find out more about, and become involved in, PACE. We were planning different strategies for the upcoming year. 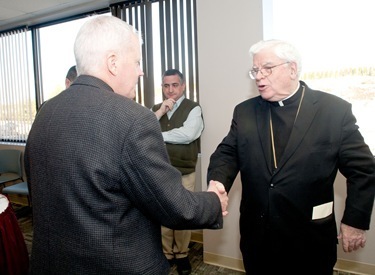 Among those gathering with us were Bishop McManus of Worcester and Bishop McDonnell of Springfield; the superintendents of schools from the four dioceses of Massachusetts; Frederick Kalisz, who is the executive director of PACE; and Steve Perla, who is president of the board. Augustinian Fathers Jorge Reyes and Bill Garland came to see me Friday. 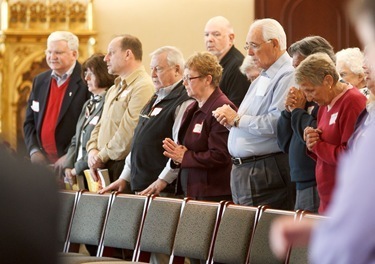 The Augustinians have been a presence in the diocese for 200 years. 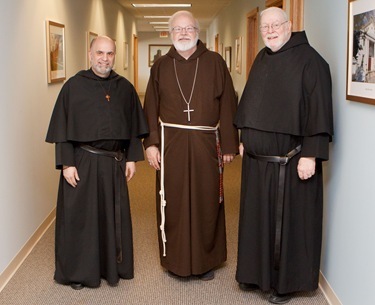 Father Garland is the treasurer of the Augustinian community and Father Jorge is pastor of Saint Mary of the Assumption Parish in Lawrence. They were here for a visit and for lunch. 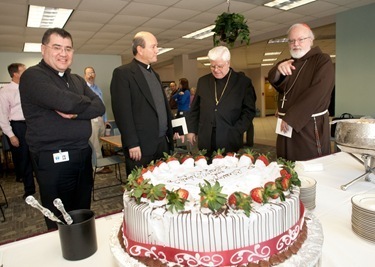 Also that day, we hosted a reception for Bishop Emilio Allué at our Pastoral Center to honor him on his retirement. It also happened to be his birthday. So we could say the cake served a dual purpose! 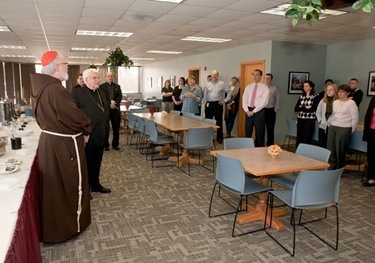 It was one way of expressing our gratitude for all his services to the archdiocese, which is obviously continuing in his retirement. 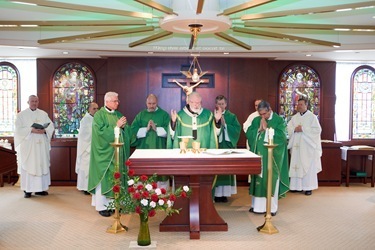 He is still very much involved in Hispanic ministry and helping in the parishes. 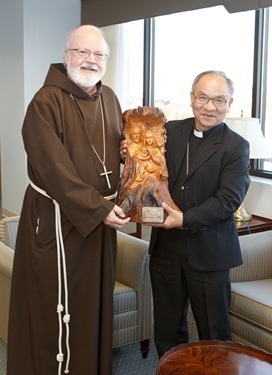 We were very grateful to have this opportunity to honor Bishop Allué for his years of service to the archdiocese. 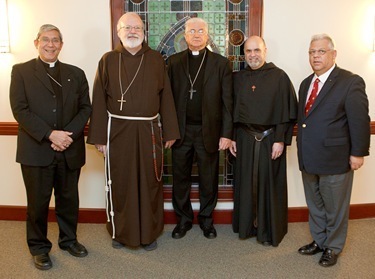 On Saturday we hosted a visit by Archbishop Dionisio García Ibañez of Santiago de Cuba at our Pastoral Center. 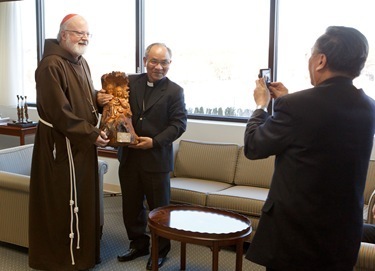 The archbishop is in the United States meeting members of the Cuban community in preparation for the 400th anniversary celebration of the finding of the image Nuestra Señora de la Caridad del Cobre (Our Lady of Charity), the patroness of Cuba. He was also accompanied by Bishop Octavio Cisneros, a good friend of mine who is an auxiliary bishop of Brooklyn, and Mario Paredes, who worked with me in Hispanic ministry back in the ‘70s. 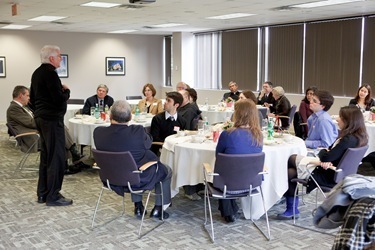 He was with us for a lunch, which a number of the members of the local Cuban community attended. Among them was Consuelo Isaacson, the president of our local Friends of Caritas Cubana group, which works to provide humanitarian and social service relief to people in Cuba. 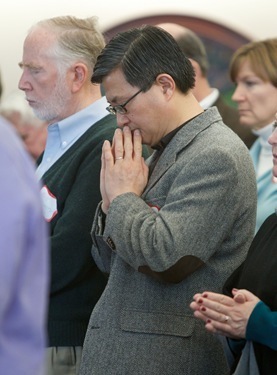 Also, Dr. Ralph de la Torre, the president of our Caritas Christi hospital network, was in attendance. After lunch, the archbishop talked a little bit about the history of Our Lady of Charity and the plans for the anniversary celebration. 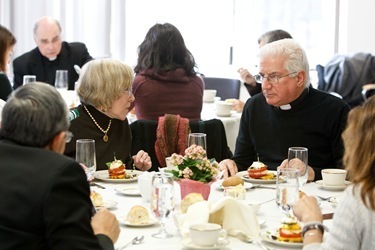 He also took questions from the guests about a number of topics such as the situation of the Church in Cuba, present developments in the country and the release of prisoners through the mediation of the Church. 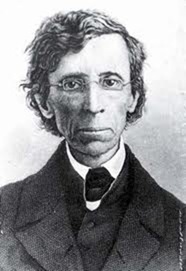 Bishop Cisneros was also the postulator of the cause of Servant of God Felix Varela. He was a Cuban priest who worked ministering to Irish immigrants in New York in the early 1800’s, and he provided everyone attending with a wonderful video on the life of Servant of God Varela. 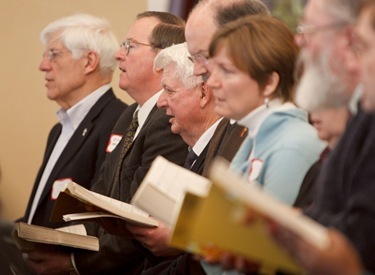 Also that day, we joined our deacons and their wives who were holding their their day-long convocation. Archbishop García Ibañez and Bishop Cisneros joined me for the Mass. 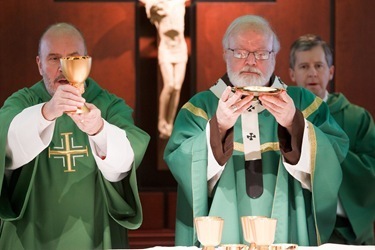 We were accompanied by Deacons Dan Burns and Pat Guerrini, who work on our permanent diaconate program, as well as Father Tom Foley, our Secretary for Parish Life and Leadership. 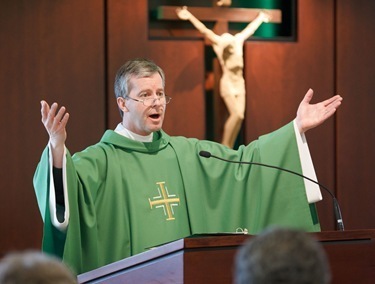 Father Foley’s office helps oversee that program. 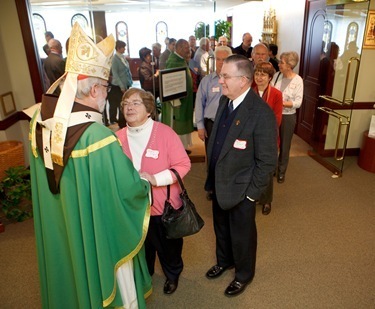 After the Mass I had a chance to greet the deacons and their wives. 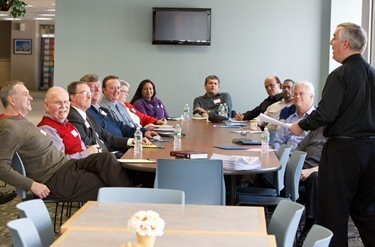 Throughout the day they attended talks and workshops designed to help them in their ministry. 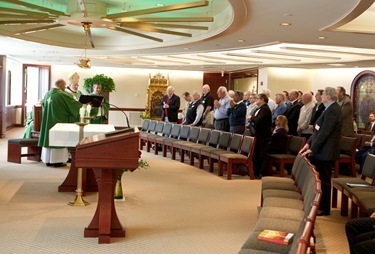 Sunday we returned for the third trip to Ireland as part of the Apostolic Visitation to the Archdiocese of Dublin. On Sunday afternoon we participated with Archbishop Diarmuid Martin in a Liturgy of Lament and Repentance for the Sexual Abuse of Children by Priests and Religious. 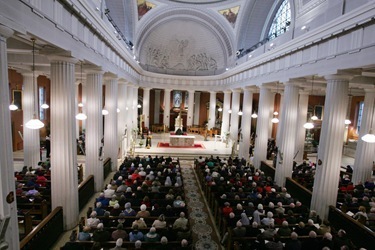 The service was held at St. Mary’s Pro-Cathedral in Dublin and many of the survivors groups were involved in preparing the ceremony and participating in it. We were very pleased that the service was so well attended, the cathedral was filled. My brothers and sisters, I am very grateful for this opportunity to be with you today and to take part in such a moving service of reparation and hope. I am especially thankful to our Holy Father, Pope Benedict, for his care for the Church in Ireland and for inviting me to be part of this Visitation. On behalf of the Holy Father, I ask forgiveness for the sexual abuse of children perpetrated by priests and the past failures of the Church’s hierarchy, here and in Rome; the failure to respond appropriately to the problem of sexual abuse. Publicly atoning for the Church’s failures is an important element of asking the forgiveness of those who have been harmed by priests and bishops, whose actions — and inactions — gravely harmed the lives of children entrusted to their care. The warrior did not understand too much about liturgy and rituals, but he did understand that discipleship is often difficult. It means carrying the Cross. It is a costly grace and often we fall down on the job. Jesus teaches us about His love in the Parable of the Good Samaritan where in a certain sense the Samaritan represents Christ, who is so moved to compassion by the sight of the man left half dead on the road to Jericho. The innocent victim of the crime is abandoned by all. The priests and levites turn their back on him, the police fail to protect him, the innkeeper profits from the tragedy. It is Christ who identifies with the man who is suffering and showers compassion on him. Jesus is always on the side of the victim, bringing compassion and mercy. Jesus is not just the healer in the Gospel. He identifies with the sick, suffering, homeless, all innocent victims of violence and abuse and all survivors of sexual abuse. The Parable ends with injunction; ‘Go and do likewise!’; just as Jesus turns His love and compassion to those who have been violently attacked or sexually abused. We want to be part of a Church that puts survivors, the victims of abuse first, ahead of self-interest, reputation and institutional needs. We have no doubt of Jesus’ compassion and love for the survivors even when they feel unloved, rejected, or disgraced. Our desire is that our Church reflect that love and concern for the survivors of sexual abuse and their families and be tireless in assuring the protection of children in our Church and in society. 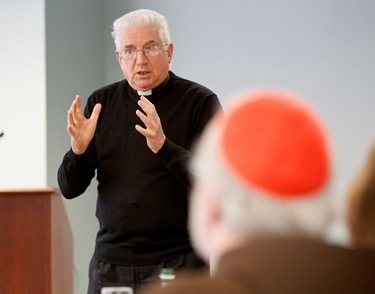 From my own experience in several dioceses with the tragic evil of sexual abuse of minors I see that your wounds are a source of profound distress. Many survivors have struggled with addictions. Others have experienced greatly damaged relationships with parents, spouses and children. The suffering of families has been a terrible and very serious effect of the abuse. Some of you have even suffered the tragedy of a loved one having taken their own life because of the abuse perpetrated on them. The deaths of these beloved children of God weigh heavily on our hearts. The wounds carried in Ireland as a result of this evil are deep and remind us of the wounds of the body of Christ. We think of Jesus in the Garden of Gethsemane as he experienced his own crisis. He, too, was overwhelmed with sorrow, betrayed and abandoned. Not only survivors of abuse and their family members, but many of the faithful and clergy throughout Ireland can echo our Lord’s plaintive cry, ‘My God, my God, why have you forsaken me?’ But today, through the saving power of the Cross, we come together to share in each other’s sorrows as well as our collective hope for the future. We come together to bind up the wounds we carry as a result of this crisis and to join in prayer for healing, reconciliation and renewed unity. 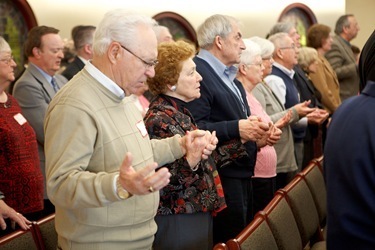 Based on the experience I have had with this Visitation, I believe there is a window of opportunity for the Church here to respond to the crisis in a way that will build a holier Church that strives to be more humble even as it grows stronger. While we have understandably heard much anger and learned of much suffering, we have also witnessed a sincere desire to strengthen and rebuild the Church here. We have seen that there is a vast resource, a reservoir of faith and a genuine desire to work for reconciliation and renewal. During the course of many meetings, I have been blessed to hear from many survivors and their families, lay women and men and religious and clergy who seek reconciliation and healing. Today’s service, which survivors so generously assisted in planning and are participating in, gives testimony to the longing of so many to rebuild and renew this Archdiocese and the Church throughout Ireland. 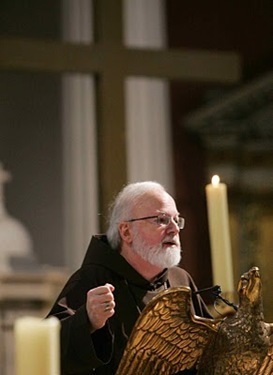 Just as the Irish people persevered and preserved the faith when it was endangered, and carried it to many other countries, the commitment to sustain the faith provides the opportunity for the hard lessons of the crisis to benefit the Church in our quest to do penance for the sins of the past and to do everything possible to protect children in the present and in the future. I would like to conclude my remarks by sharing another parable with you that further illustrates the demands of the Great Commandment which contains the whole Law and the prophets. The Japanese tell the story of a man who lived in a beautiful home on the top of a mountain. Each day he took a walk in his garden and looked out at the sea below. One day he spotted a tsunami on the horizon coming toward the shore and then he noticed a group of his neighbors having a picnic on the beach. The man was anxious to warn his neighbors, he shouted and waved his arms. But they were too far off, they could not hear nor see him. So the man set fire to his house. When the neighbors on the beach saw the smoke and flames some said let us climb the mountain to help our friend save his home. Others said: ‘That mountain is so high and we’re having such fun, you go.’ Well, the ones who climbed the mountain to save their neighbor’s home were themselves saved. Those who remained on the beach having fun perished when the tidal wave hit the shore. The Gospel of Christ is about love, sacrifice, forgiveness, hope and salvation. The burning house on the top of the hill is the Cross, and it is the suffering of all those children who experienced abuse. Climbing the mountain, we are not doing God a favor, we are saving our souls. The service was a very moving experience and I think very meaningful for all of those who were a part of it. 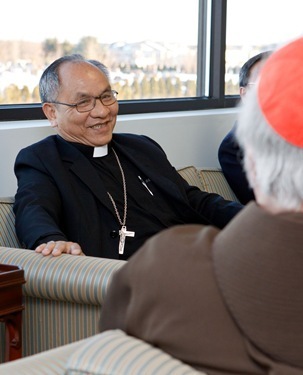 For the rest of the week, we continued our meetings and interviews with priests, lay leaders and survivors of sexual abuse. I think by now, over the three visits, we met with more than 200 people. 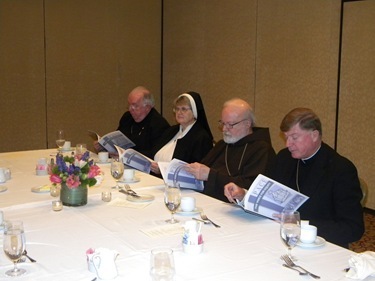 Now, we will work on preparing our part of the report that will be presented to the Holy Father. It is important to remember that the visitation is multi-faceted. 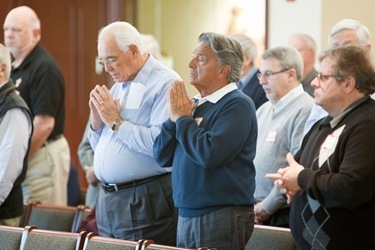 Each of the archdioceses is being visitated, as are the seminaries, the religious communities and the institutions they sponsor, and all those visitators will contribute to the final report.